The sugar cane industry produces significant amounts of cane trash and bagasse. Inappropriate disposal of agro-wastes can lead to environmental problems. Converting wastes such as cane trash and bagasse (Bg) to a fertilizer and conditioner is the aim of sustainable waste management in sugar cane industry. Cow dung (CD), kitchen waste (KW), and sewage sludge (SS) were mixed with bagasse as amendment in different proportions: Bg:CD (1:1), Bg:CD (1:2), Bg:SS (1:1), Bg:SS (1:2), Bg:KW (1:1) and Bg:KW (1:2) in triplicate treatment with Eisenia fetida. Chemical analysis of the samples showed a significant decrease in total organic carbon (TOC) (20%-54%), total Kjeldahl nitrogen (TKN) (9.5%-39.7%) and C:N ratio (12%-31.2%), while total potassium (31.4%-54%) and available phosphorus (32%-55%) contents increased during vermicomposting. A significant difference was observed among weight and number of worms in control with other treatments at the end of vermicomposting. According to obtained results vermicomposting is an efficient method for sustainable recycling different classes of waste produced in sugar cane agro-industry. 1. Najafi G, Ghobadian B, Tavakoli T, Yusaf T. Potential of bioethanol production from agricultural wastes in Iran. Renew Sust Energ Rev 2009; 13(6-7): 1418-27. 2. Alavi N, Amir-Heidari P, Azadi R, Babaei AA. Effluent quality of ammonia unit in Razi petrochemical complex. 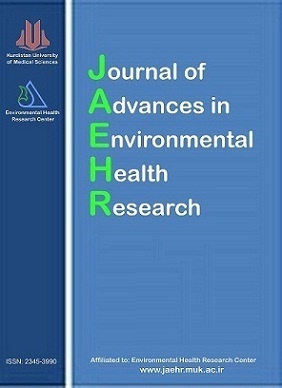 J Advan Environ Health Res 2013; 1(1): 15-20. 3. Kaushik P, Garg VK. Vermicomposting of mixed solid textile mill sludge and cow dung with the epigeic earthworm Eisenia foetida. Bioresour Technol 2003; 90(3): 311-6. 4. Singh RP, Embrandiri A, Ibrahim MH, Esa N. Management of biomass residues generated from palm oil mill: Vermicomposting a sustainable option. Resour Conserv Recy; 2011; 55(4): 423-34. 5. Ravindran B, Contreras-Ramos SM, Sekaran G. Changes in earthworm gut associated enzymes and microbial diversity on the treatment of fermented tannery waste using epigeic earthworm Eudrilus eugeniae. Ecol Eng 2015; 74: 394-401. 6. Hait S, Tare V. Vermistabilization of primary sewage sludge. Bioresour Technol 2011; 102(3): 2812-20. 7. Hanc A, Chadimova Z. Nutrient recovery from apple pomace waste by vermicomposting technology. Bioresour Technol 2014; 168: 240-4. 8. Lim SL, Wu TY, Sim EYS, Lim PN, Clarke C. Biotransformation of rice husk into organic fertilizer through vermicomposting. Ecol Eng 2012; 41: 60-4. 9. Sen B, Chandra TS. Chemolytic and solid-state spectroscopic evaluation of organic matter transformation during vermicomposting of sugar industry wastes. Bioresour Technol 2007; 98(8): 1680-3. 10. Kumar R, Verma D, Singh BL, Kumar U, Shweta. Composting of sugar-cane waste by-products through treatment with microorganisms and subsequent vermicomposting. Bioresour Technol 2010; 101(17): 6707-11. 11. Sangwan P, Kaushik CP, Garg VK. Vermicomposting of sugar industry waste (press mud) mixed with cow dung employing an epigeic earthworm Eisenia fetida. Waste Manag Res 2010; 28(1): 71-5. 12. Pramanik P. Changes in microbial properties and nutrient dynamics in bagasse and coir during vermicomposting: quantification of fungal biomass through ergosterol estimation in vermicompost. Waste Manag 2010; 30(5): 787-91. 13. Pigatin LB, Atoloye IA, Obikoya OA, Borsato AV, Rezende MO. Chemical study of vermicomposted agroindustrial wastes. Int J Recycl Org Waste Agricult 2016; 5(1): 55-63. 15. Nelson D, Sommers LE. Total carbon and organic carbon and organic matter. In: Page AL, Miller RH, Keeney DR, Editors. Methods of soil analysis. Madison, WI: American Society of Agronomy; 1996. p. 539-79. 16. Bremner JM. Nitrogen-total. In: Sparks DL, Editor. Methods of soil analysis part. 3. chemical methods, soil. Madison, WI: Soil Science Society of America; 1996. p. 1085-121. 17. Olsen SR, Cole C, Watanabe F, Dean LA. Estimation of available phosphorus in soils by extraction with sodium bicarbonate. Washington, DC: U.S. Dept. of Agriculture; 1954. 18. Santhi R, Natesan R, Bhaskaran A, Murugappan V. Procedures for soil testing and water quality appraisal. Coimbatore, India: Tamil Nadu Agricultural University; 2003. 19. Alavi N, Azadi R, Jaafarzadeh N, Babaei A. Kinetics of Nitrogen Removal in an Anammox Up-Flow Anaerobic Bioreactor for Treating Petrochemical Industries Wastewater (Ammonia Plant). J Asian Chem 2011; 23(12): 5220-4. 20. Ndegwa PM, Thompson SA, Das KC. Effects of stocking density and feeding rate on vermicomposting of biosolids. Bioresour Technol 2000; 71(1): 5-12. 21. Suthar S. Vermistabilization of municipal sewage sludge amended with sugarcane trash using epigeic Eisenia fetida (Oligochaeta). J Hazard Mater 2009; 163(1): 199-206. 22. Plaza C, Nogales R, Senesi N, Benitez E, Polo A. Organic matter humification by vermicomposting of cattle manure alone and mixed with two-phase olive pomace. Bioresour Technol 2008; 99(11): 5085-9. 23. Suthar S. Nutrient changes and biodynamics of epigeic earthworm Perionyx excavatus (Perrier) during recycling of some agriculture wastes. Bioresour Technol 2007; 98(8): 1608-14. 24. Suthar S. Recycling of agro-industrial sludge through vermitechnology. Ecol Eng 2010; 36(8): 1028-36. 25. Babaei AA, Azadi R, Jaafarzadeh N, Alavi N. Application and kinetic evaluation of upflow anaerobic biofilm reactor for nitrogen removal from wastewater by Anammox process. Iranian J Environ Health Sci Eng 2013; 10(1): 20. 26. Sanchez-Monedero MA, Roig A, Paredes C, Bernal MP. Nitrogen transformation during organic waste composting by the Rutgers system and its effects on pH, EC and maturity of the composting mixtures. Bioresour Technol 2001; 78(3): 301-8. 27. Kumar R, Shweta. Enhancement of wood waste decomposition by microbial inoculation prior to vermicomposting. Bioresour Technol 2011; 102(2): 1475-80. 28. Benitez E, Nogales R, Elvira C, Masciandaro G, Ceccanti B. Enzyme activities as indicators of the stabilization of sewage sludges composting with Eisenia foetida. Bioresour Technol 1999; 67(3): 297-303.
greenhouse waste recycling. Bioresour Technol 2010; 101(24): 9654-60. 30. Khwairakpam M, Bhargava R. Bioconversion of filter mud using vermicomposting employing two exotic and one local earthworm species. Bioresour Technol 2009; 100(23): 5846-52. 31. Deka H, Deka S, Baruah CK, Das J, Hoque S, Sarma NS. Vermicomposting of distillation waste of citronella plant (Cymbopogon winterianus Jowitt) employing Eudrilus eugeniae. Bioresour Technol 2011; 102(13): 6944-50. 32. Busato JG, Lima LصS, Aguiar NةO, Canellas LP, Olivares FةL. Changes in labile phosphorus forms during maturation of vermicompost enriched with phosphorus-solubilizing and diazotrophic bacteria. Bioresour Technol 2012; 110: 390-5. 33. Suthar S. Vermicomposting of vegetable-market solid waste using Eisenia fetida: Impact of bulking material on earthworm growth and decomposition rate. Ecol Eng 2009; 35(5): 914-20. 34. Suthar S, Mutiyar PK, Singh S. Vermicomposting of milk processing industry sludge spiked with plant wastes. Bioresour Technol 2012; 116: 214-9. 35. Xing M, Lv B, Zhao C, Yang J. Towards understanding the effects of additives on the vermicomposting of sewage sludge. Environ Sci Pollut Res Int 2015; 22(6): 4644-53. 36. Gupta R, Garg VK. Vermiremediation and nutrient recovery of non-recyclable paper waste employing Eisenia fetida. J Hazard Mater 2009; 162(1): 430-9. 37. Yadav A, Garg VK. Feasibility of nutrient recovery from industrial sludge by vermicomposting technology. J Hazard Mater 2009; 168(1): 262-8. 38. Suthar S. Potential utilization of guar gum industrial waste in vermicompost production. Bioresour Technol 2006; 97(18): 2474-7. 39. Kaushik P, Garg VK. Dynamics of biological and chemical parameters during vermicomposting of solid textile mill sludge mixed with cow dung and agricultural residues. Bioresour Technol 2004; 94(2): 203-9. 40. Kaviraj, Sharma S. Municipal solid waste management through vermicomposting employing exotic and local species of earthworms. Bioresour Technol 2003; 90(2): 169-73. 41. Pramanik P, Ghosh GK, Ghosal PK, Banik P. Changes in organic-C, N, P and K and enzyme activities in vermicompost of biodegradable organic wastes under liming and microbial inoculants. Bioresour Technol 2007; 98(13): 2485-94. 42. Manna MC, Jha S, Ghosh PK, Acharya CL. Comparative efficacy of three epigeic earthworms under different deciduous forest litters decomposition. Bioresour Technol 2003; 88(3): 197-206. 43. Garg VK, Suthar S, Yadav A. Management of food industry waste employing vermicomposting technology. Bioresour Technol 2012; 126: 437-43.